Perched on two harbors, Auckland is known as the "City of Sails," offering unforgettable adventures for all levels of sailing enthusiasts. Photo courtesy of Wrenda Goodwyn. Auckland’s blend of glistening harbors and a mix of urban sophistication in a coastal setting has inspired a lifestyle that ranks among the best in the world. Within a half hour of downtown Auckland, visitors can relax on an island in the Hauraki Gulf. Explore Devonport, the beautiful village by the sea. Trek through a rainforest. Sample wines at a local vineyard. Walk the beaches. Don’t miss: Sky Tower, the tallest structure in the southern hemisphere at 1,075 feet tall, offers 360-degree views of Auckland and the chance to skywalk around the outside or for the brave, skyjump to the street below. A visit to the New Zealand Maritime Museum. A stroll around the Viaduct Harbor to admire the super yachts. It is only a three-hour drive from Auckland to Paihia on the Northland’s east coast. Here, the beautiful Bay of Islands offers 144 islands to explore and endless opportunities for fun and adventure in this land of secluded bays, tranquil harbors, swimming, fishing and diving. 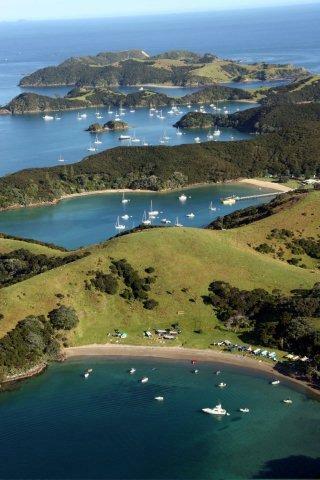 With its pristine landscapes, the largest of the 144 islands in the Northland's Bay of Islands is Urupukapuka Island. This shimmering aquatic paradise is a popular destination for boating, kayaking, sailing, camping and diving. Photo courtesy of Destination Northland. The Northland region covers the area from north of Auckland through to Cape Reinga, where the Tasman Sea merges with the Pacific Ocean, a place of spiritual significance to the Maori. It is a region offering golden beaches and secluded coves fringed by Pohutukawa trees on the east coast, to the wild coastline and ancient forests of the Hokianga on the west coast, steeped in fascinating history. Known as “The Birthplace of New Zealand,” Northland is rich in a unique history that ties both Maori and non-Maori together, where visitors discover genuine, contemporary Maori culture. It was here the historic Treaty of Waitangi was signed. Many of the area’s visitors begin their trip with the ferry crossing from Paihia to the tranquil historic village of Russell. Following a tour of the quaint town with its panoramic views, visitors enjoy a dinner of fresh, seasonal Northland produce and a spectacular sunset from the porch of the Duke of Marlborough, New Zealand’s oldest licensed hotel. Don’t miss: Board the R. Tucker Thompson for a day of tall ship sailing. Beachcombing at its best. Tea and scones served onboard and a scrumptious lunch prepared by the pirates (crew) of the ship. Passengers may participate in hoisting the sails, taking a turn at the helm, riding the bowspirit or bravely climbing the rigging. From the seaside town of Paihia in the Bay of Islands, visitors take a short ferry ride to explore the historic village of Russell. Photo courtesy of Wrenda Goodwyn. New Zealand’s capital, Wellington, is the southern-most city on the North Island. It sits at the center of the country and is the gateway to the South Island. With a city population of 180,000 and the wider Wellington region with 400,000, it is regarded as a major hub for arts and culture. This energetic city was named among the “Top Ten Cities of 2011” by Lonely Planet, making it “The Coolest Little Capital in the World.” Don’t miss: A ride on the historic cable car that takes you to the Botanic Garden. The Museum of New Zealand. Zealandia: the Karori Sanctuary Experience, a groundbreaking eco-attraction. Visit a Maori heritage center. Take the train to Wairarapa and visit Gladstone Winery and the gardens of Assisi and Richmond. Take a tour of Middle earth film locations and learn about Wellywood, production central for Peter Jackson’s Lord of the Rings trilogy. After a journey across Wilmont Pass, travelers arrive at Deep Cove, the beginning of Doubtful Sound. This spectacular view is one of the most photographed in New Zealand. Photo courtesy of Destination Fiordland. Marine life thrives in the fiords, home to bottlenose dolphins, New Zealand fur seals, Fiordland crested and little blue penguins and whales. Scenic cruises and kayak tours explore the fiords and wildlife in its natural habitat. This primeval landscape carved by ice is surrounded by otherworldly forests. It is indescribable because it does not exist anyplace else. Milford Sound is the only fiord accessible by land. The journey begins in the small picturesque town on the shores of Lake Te Anau and is the departure point for many walking tracks. Don’t miss: Take a float plane over the Kepler Mountains. 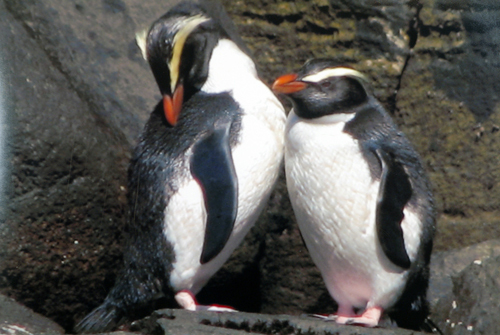 A day tour to Milford Sound combining guided walking through magical scenery and a boat cruise. Experience the Fiordland rainforest with a guided nature walk. Experience a scenic jetboat on the Upper Waiau River. Doubtful Sound offers an unforgettable experience for those willing to make the journey to this pristine wilderness. It requires a cruise across Lake Manapouri and a coach ride over Wilmont Pass, stopping along the way to experience Fiordland’s densest rain forest. Upon arrival at Deep Cove, board the Fiordland Navigator for a one night cruise that includes basic accommodations, dinner and breakfast. Don’t miss: Kayaking, wildlife viewing and exploring by tender craft with a nature guide. Doubtful Sound. Photo courtesy of Destination Fiordland. 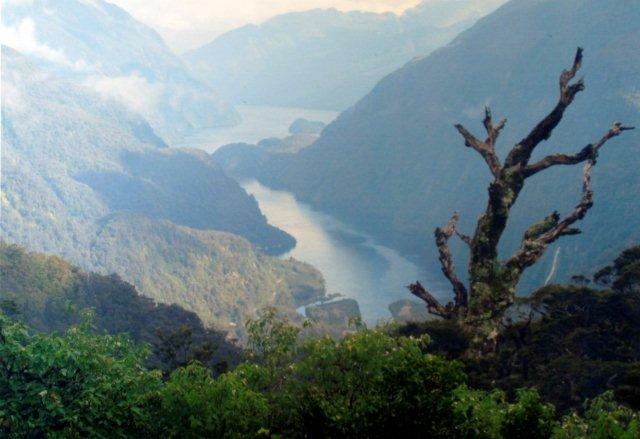 It is said that Doubtful Sound was named Doubtful Harbor in 1770 by Captain Cook. He did not enter the inlet as he was concerned that it might not be navigable under sail. But anyone who takes the trip is certain that it was given the name because it is doubtful that there is a more beautiful place on earth. Air New Zealand flies to Auckland with daily nonstop flights from Los Angeles and San Francisco. Flights depart the west coast in the evening and arrive in New Zealand early in the morning two days later, crossing the international dateline. Flight time from the west coast to Auckland: 13 hours. Same-day domestic connections are possible from Southwest Florida International Airport. Air New Zealand has 26 flights a day between Auckland and Wellington, so connecting flights within New Zealand are available at all times. Returning from New Zealand, flights depart in the evening from Auckland and arrive on the west coast earlier in the same day, thus gaining the day that was lost! An option after the flight is to stay overnight and take an early morning flight from L.A. or San Francisco back to Southwest Florida. Time difference: New Zealand is 18 hours ahead of Southwest Florida. Photo courtesy of Jerry Bloch.For the year ending September 2011, 185,272 Americans visited New Zealand. 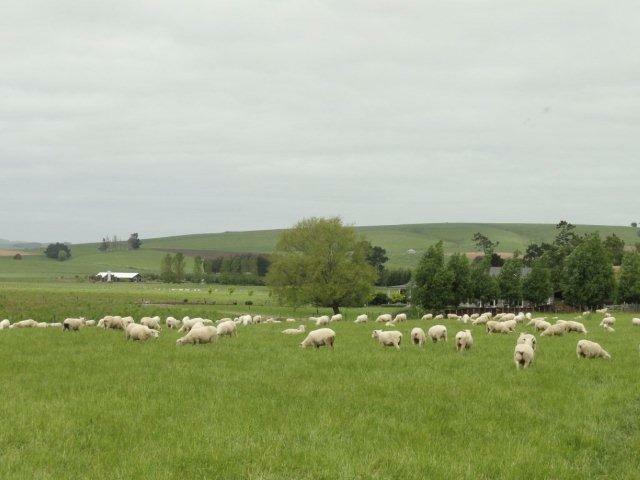 There are more than 30 million sheep in the country and 4.4 million residents. It is one of the world’s least crowded countries. The north of New Zealand is subtropical and the south is temperate. The warmest months are December through January (68-86 F). The coldest are June, July and August (50-59 F). New Zealanders drive on the left! Auckland is New Zealand’s largest city with a population of more than 1.3 million. Known as the “city of sails,” it has more boats per person than any other city in the world. New Zealanders are passionate about rugby and avidly support the national team, the All Blacks. The country hosted the Rugby World Cup in 2011. About 15 percent of the population is of Maori descent. New Zealand’ first settlers, they made an epic journey from Polynesia to the north of New Zealand about 1,000 years ago. The Maori have a rich and dynamic culture which captures their age-old connection with the spiritual and natural worlds. More than 80 percent of the native flora is not found anyplace else in the world. New Zealand is home to the world’s only flightless parrot, the Kakapo, as well as the only Alpine parrot, the Kea. The rare, flightless Kiwi, is unique to New Zealand and sadly, like many native birds, its survival is tenuous. One third of the country is protected in parks and reserves. New Zealand comprises two main islands (the North and South Islands) and many small islands. The combined land total is approximately 100,000 square miles. Europeans rediscovered New Zealand in 1769, when British naval captain James Cook and his crew laid claim to New Zealand. Being an island nation with a long history of isolation and having no land mammals apart from bats, the birds of New Zealand have evolved to include a large number of unique species. When Captain James Cook arrived he noted that the bird song was deafening. In 1840 the treaty of Waitangi was signed by the Maori people of New Zealand and the European settlers. Today, New Zealand is an independent state of the Commonwealth. The GovernorGeneral represents the Queen of England in New Zealand. New Zealand is the first country in the world to see each new day’s sunrise. The wine industry has achieved an international reputation in a short time. The long growing season and cool climate make ideal conditions for grape growing. More than 150 different locations throughout New Zealand were used to film The Lord of the Rings trilogy. Next from Academy Award-winning filmmaker Peter Jackson, The Hobbit: An Unexpected Journey, set for release in December 2012; and The Hobbit: There and Back Again, set for release in December 2013. Fiordland is the centerpiece of the UNESCO World Heritage Site, Te Wahipounamu, reknowned for its dramatic scenery and encompassing the iconic Milford and Doubtful Sounds.